The Food and Drug Administration has issued warning letters to five distributors of pure powdered caffeine, saying the products put consumers at risk. The letters, which are dated Aug. 27, follow the overdose deaths last year of two young men from Ohio and Georgia. Caffeine powder is usually marketed as a dietary supplement and is unregulated, unlike caffeine added to soda. Since the FDA doesn't have the legal authority to pull such a substance off the shelves, the agency has been building a case against those who are marketing it in bulk in an attempt to persuade them to stop. 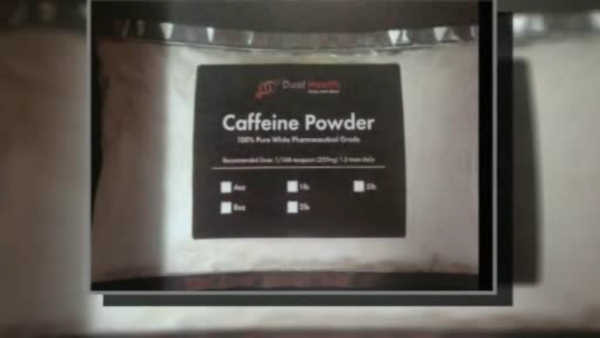 Last summer, the FDA warned consumers to avoid pure powdered caffeine. The agency said in a statement Tuesday that it sent the warning letters to the distributors "because these products are dangerous and present a significant or unreasonable risk of illness or injury to consumers." A teaspoon of pure powdered caffeine is roughly equivalent to 28 cups of coffee, according to the FDA. The difference between a safe and toxic amount is very small. And a safe serving can be nearly impossible to measure with common kitchen tools. "Volume measures, such as teaspoons, are not precise enough to calculate how many milligrams of caffeine are in the serving size," the FDA said. The packages of pure caffeine referenced in the warning letters contain hundreds or thousands of servings of the stimulant. Such packaged quantities are potentially lethal to consumers, the agency said. Some teenagers and young adults have been particularly drawn to the powder for an energy boost. Users add it to drinks for a pick-me-up before workouts or to control weight gain. Eighteen-year-old Logan Stiner, of LaGrange, Ohio, died in May 2014 after consuming it. It was also linked to the June 2014 death of 24-year-old Wade Sweatt, of Alpharetta, Georgia. Stiner's parents and U.S. Sen. Sherrod Brown, D-Ohio, have urged federal regulators to prohibit sales of the stimulant, and said Tuesday they would continue their push. In a written statement, Brown called the letters "a step in the right direction." Brian Balser, an attorney for Stiner's parents, said the letters were a positive move. The FDA sent the warning letters last week to Bridge City Bulk - Bridge City LLC; Hard Eight Nutrition LLC; PureBulk Inc.; SPN LLC, which does business as Smartpowders; and Kreativ Health Inc., which does business as Natural Food Supplements. Their products are offered for sale online, according to the letters. The companies have 15 days to respond to the agency. Ron Rudnuck, president of Kreativ Health, told The Associated Press in a phone interview Tuesday that he would be taking its powdered caffeine off the market. Kevin Baronowsky of Hard Eight Nutrition, which does business as BulkSupplements.com, said in light of the FDA's letter, he's chosen to stop selling the powder to consumers. "We now only offer pure caffeine powder to manufacturers that use it as an ingredient in their products," he said in an email. Tonya Nelson, who handles quality assurance at PureBulk, said the company was preparing its response to the FDA. She declined to comment further. Jeff Stratton from Bridge City said in an email that the company immediately stopped selling the powder and responded to the FDA's letter. He said the company had received no complaints and negative reports about it. A message seeking comment was left Tuesday with Smartpowders.